Are there any points that you specifically disagree with? Or are you just hatin'? The subject of continued attacks by conservative and anti-gay commentators, Fox musical dramedy "Glee" got a vocal defense from the President of GLAAD, Jarrett Barrios, on Friday. "Fair-minded Americans are tuning in by the millions to inclusive shows like 'Glee' and 'Modern Family' because they don’t care whether someone is straight or gay – what they care about is seeing characters and stories they can relate to," Barrios told The Hollywood Reporter. Barrios, whose organization gave a shared award to the two shows for "Outstanding Comedy Series," at this year's GLAAD Media Awards, made his comments in light of the criticism that followed a 90-minute, self-acceptance and tolerance episode of "Glee," featuring a cast performance of Lady Gaga's gay rights-anthem "Born This Way." Before the episode even aired, conservative media critic Dan Gainor ripped creator Ryan Murphy, telling ABC News that it was Murphy's "latest depraved initiative to promote his gay agenda." "This is clearly Ryan Murphy's vision of what growing up should be, not most of America's," he said. "It's a high school most parents would not want to send their kids to." The show features Golden Globe-winning star Chris Colfer, who plays gay teen and choir star Kurt. He's battled bullying (from a closeted gay bully) and identity issues, and has this season began to date new cast member Darren Criss. On Friday, Fox News host Glenn Beck ripped the show with a dash of backhanded praise. Those attacks were just the latest assault on the show; perhaps most prominently, former "Saturday Night Live" cast member Victoria Jackson ripped the show on her WorldNetDaily blog and on Headline News. The comments came after a buzzed about kiss between Colfer and Criss. "Did you see 'Glee' this week? Sickening! And, besides shoving the gay thing down our throats, they made a mockery of Christians – again!" she wrote. "I wonder what their agenda is? Hey, producers of 'Glee' – what's your agenda? One-way tolerance?" Then, on HLN, Jackson, a religious conservative, said, "Well, it doesn't matter what I think. What matters is what the Bible says. And I'm really concerned about our country because immorality is, well, let's see: secular humanism rules the airwaves, and it's stealing the innocence away from this whole generation of children. My daughter is a teenager and I cant find any show that she can watch." 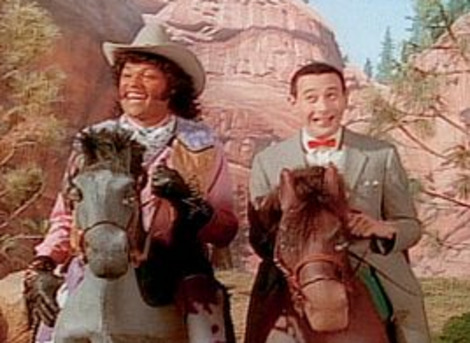 The show also has received criticism of its depiction of the religious and conservative. In a recent episode, Kathy Griffin played a Sarah Palin-like Tea Party candidate, to the jeers of many on the right. Larry O'Connor, columnist for Andrew Breitbart's BigHollywood, took on that issue. "So in this episode of 'Glee' the writers have pretty much come full circle in their bigotry and intolerance," O'Connor wrote. "They did to us exactly what they feel has been done to gay people on television for years: provided a false and stereotypical character meant to convey a negative image and message to the viewer. There's a word for that: Defamation (for those of you paying attention, Defamation is what the 'D' in GLAAD stands for)." Thus far, the American public has largely disagreed with the criticisms of the show; "Glee" is one of the top-rated scripted shows on TV, and its musical anthology releases have been so overwhelmingly successful that they've placed 113 songs on the Billboard Hot 100 chart, passing Elvis for most all time. For more on the GLAAD statement, click over to The Hollywood Reporter. The Gay & Lesbian Alliance Against Defamation (GLAAD) has asked a Fox affiliate in Houston for a formal apology after their news broadcast aired a segment criticizing Glee ‘s portrayal of gay teens. Last week, Glee aired a special 90-minute episode inspired by Lady Gaga’s “Born This Way” and devoted to teaching the series’ characters to celebrate what makes them unique. After the broadcast, Houston Fox affiliate KRIV-26 aired a segment called “Is TV Too Gay?” which focused on whether or not shows like Glee “delve too much into homosexual relationships.” One of the panelists, Bryan Fischer from the American Family Association, reprimanded Glee for portraying homosexuality which, in his words, “is conduct that bears enormous psychological and physical risk to those that engage in it.” GLAAD says that the channel has yet to issue a formal apology, and claims KRIV-26 initially seemed remorseful about the segment but now stands behind it. I don't think the station needs to apologize for the opinions of a single panelist. Most stations carry a standard disclaimer that goes something like "the views expressed are solely those of the panelists and do not reflect the opinions of this station, its network, or affiliates." If GLAAD wants an apology, why not get it from the panelist who made the offending statement? Would they have had a segement called is tv to straight though? I doubt it. Glee ’s Chris Colfer has his day in New York. As told to Jada Yuan. 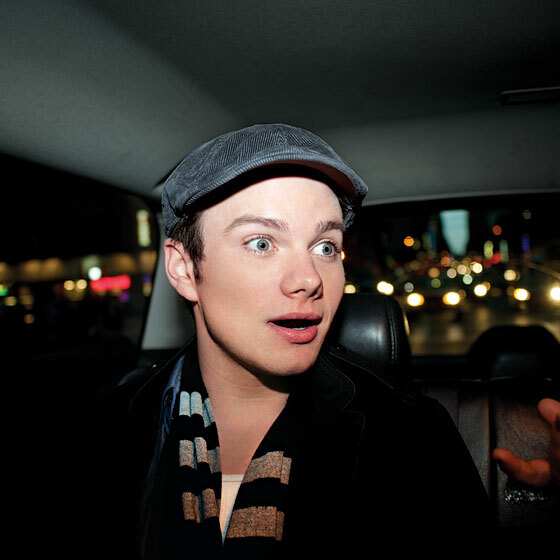 Chris Colfer on the way to Wicked, May 6, 2011. T he first time I came to New York was right after Glee ’s pilot was shot. The cast had all come from different parts of the world, so when we got to [Los Angeles], no one knew anyone but each other. And then we were all so sad because we didn’t know if the show was going to get picked up or if we’d ever see each other again. So I made plans to go see Lea [Michele] and Jenna [Ushkowitz] as soon as we wrapped. They were doing Spring Awakening on Broadway, and I slept on Lea’s couch. It was my first big trip by myself. I was terrified. Clovis [California], where I grew up, is very flat, very farm-driven, very conservative, and very spread out. I remember thinking New York was so claustrophobic. I just wanted to go home. Now I come four times a year, and every time, I fall in love with the city even more. That trip, I saw seven Broadway shows in six days—Hairspray, Shrek, Gypsy, Avenue Q, Mary Poppins, and Spring Awakening a couple times. I was 18, and I had my Fresno City College I.D. to get discounted tickets. Lea and Jenna would drop me off at one theater, perform, then pick me up. It was like day care. Once the girls called and said to meet them somewhere and to grab a cab. I had never gotten a cab in my whole life! I didn’t know what to do: How do you know which ones are working? It was so stressful. I pretended that I was staying at a hotel, and had the doorman get me a cab! Now, even if something is three blocks away, I have to take a cab. It’s a safety thing so no one follows me. I got to see Wicked and Sister Act, though not The Book of Mormon, because we couldn’t get tickets. There are situations where I could pull the “I’m on a TV show” card and, you know, use my accomplishments for evil instead of good. But, I hate to say this, it really is almost dangerous for us to go out now because it gets so intense. It becomes a stampede. I’ve had to call the police. The minute Ashley Fink [who plays Lauren Zizes] and I sat down at Wicked, people started asking for autographs. A choir teacher said, “We have a group of about 300 choir kids behind you.” And I was, like, “Oh, no! [laughs] We’re going to get attacked!” But they were very sweet. They just wanted us to wave. But when we were leaving, a guy wanted us to take a picture with his daughter. We tried to explain to him, “It’s going to be crazy. We have to get out of here.” And he started screaming profanities at us! [Everyone in the cast] agrees that I get it the worst. They invite me places and then go, “Actually, never mind. You ruin it for all of us, because after you’re recognized, we’ll all be in trouble.” I’m just so distinctive—my voice, my awkward features. You can’t hide me. I think it has almost everything to do with Kurt being one of TV’s first positive portrayals of a gay character. Sometimes people say, “Kurt helped me come out of the closet to my parents.” But the fans who come up most are dads—I think because Glee makes them think about what they’d do if Kurt was their son. Awww... I liked the ending tonight on Glee's prom episode! And Kurt looked good in his kilt getup! It's a wonderful town: "Glee" takes Manhattan. One was the unique experience of being a cast member on "Glee," which is probably the closest modern equivalent to Beatlemania. The brain-frazzling uniqueness of that experience might account for the innocent intensity of the performances. Even when the material stinks, the castmembers never seem to be phoning it in -- not even when they're stuck on the margins of a chorus line during someone else's solo. And they perform the romantic scenes with a circa-1955 intensity that would be laughable if it weren't so refreshing. Finn's plea to Rachel, "Take a chance on me," was a genuinely romantic moment, even with three classmates standing behind him crooning "Bella Notte" from "Lady and the Tramp." And Brittany's final speech to Santana by the lockers was sweet, too. That character could never compose such sentences, but Heather Morris' unaffected delivery made me believe them. The episode's other subject was the adoration that musical theater buffs -- and a good many moviegoers -- feel for New York City. The opening tribute to Woody Allen's "Manhattan" panned slowly around Times Square to George Gershwin's "Rhapsody in Blue", then settled on Rachel staring up at the signage like some 1930s movie hayseed. (She should have been carrying a battered old suitcase with stickers on it.) New Directions romped through Manhattan landmarks (Lincoln Center! Washington Square Park!) in an homage to "On the Town." Kurt and Rachel had their own breakfast at Tiffany's while "Moon River" played softly in the background, then did a "Wicked" number on the show's empty stage. (They're not in Ohio anymore.) Rachel said she was moving to New York after graduation: "This is where I belong." Kurt: "I am so coming, too." I love their version on NYNY.